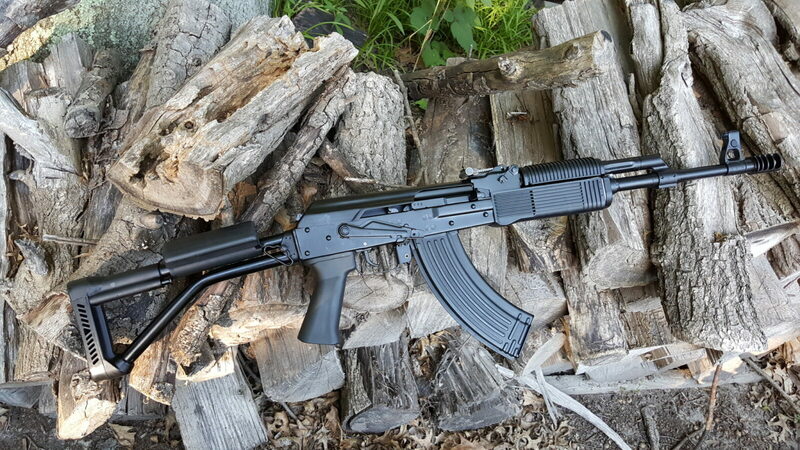 When the government announced they were going to ban the further import of Molot firearms, I jumped and bought one of the Fime FM-AK47-21 side folding AK-47 Veprs. 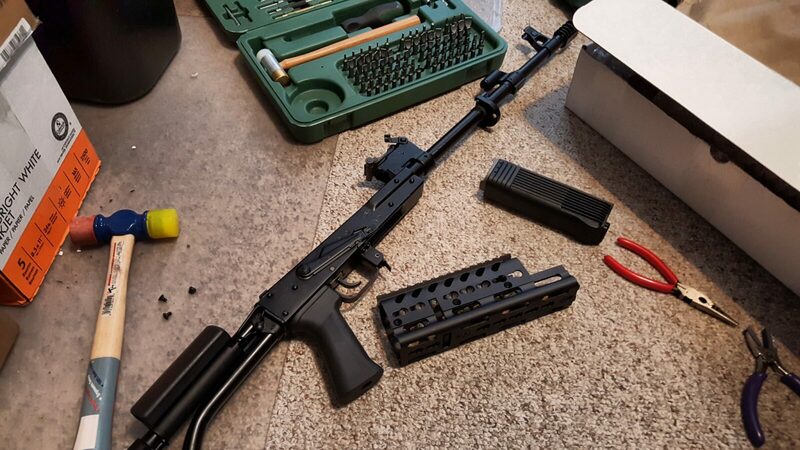 The rifle was absolutely awesome except for one regard – I really did not like the ribbed RPK handguard. 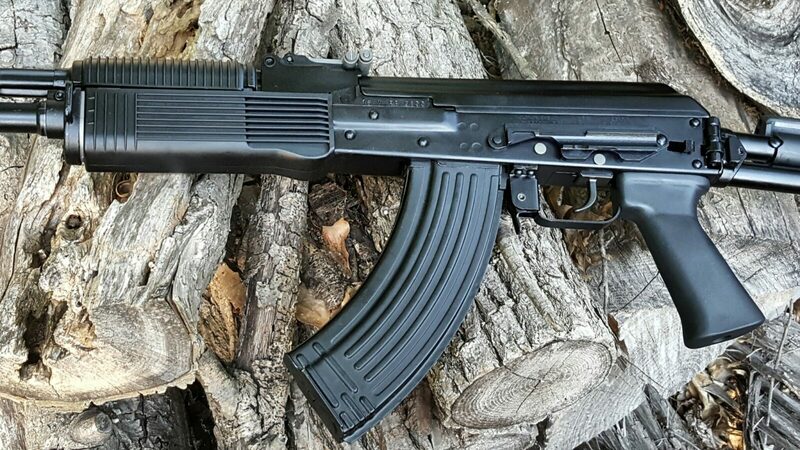 Now this is the handguard on the Russian RPks and the ribs help with cooling and moving the hand away from the surface of the handguard — the design is genuinely thought out … but I do not like the feel. It’s as simple as that. With that in mind, I started digging on options. 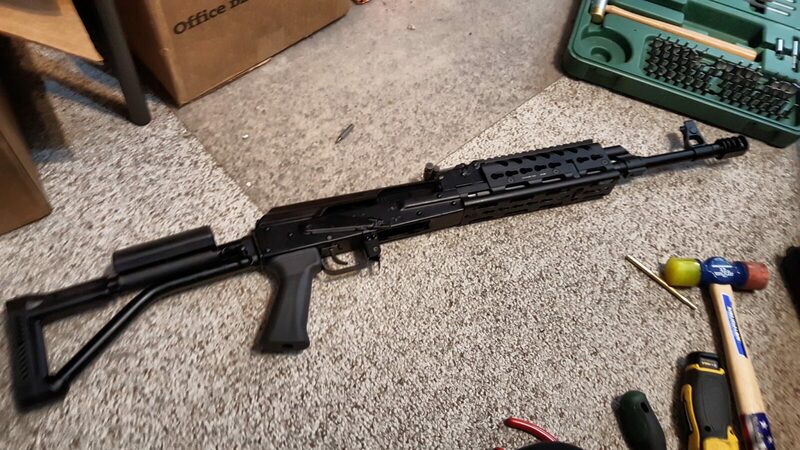 On one hand I could make a new polymer set based on a mint RPK handguard set I picked up along the way. After a while, I changed my mind as the time and cost to create the molds didn’t make a lot of business sense as the Veprs weren’t going to be imported and demand would presumably be low and I would not recover the investment. So, I researched other options and a firm I didn’t know much about kept popping up – Chaos, Inc. 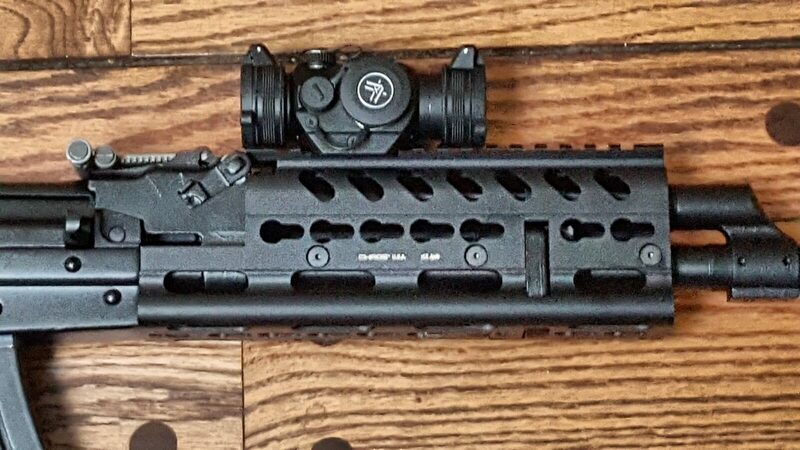 They made a well regarded handguard that looked great to me and reports on the feel and quality were very good. 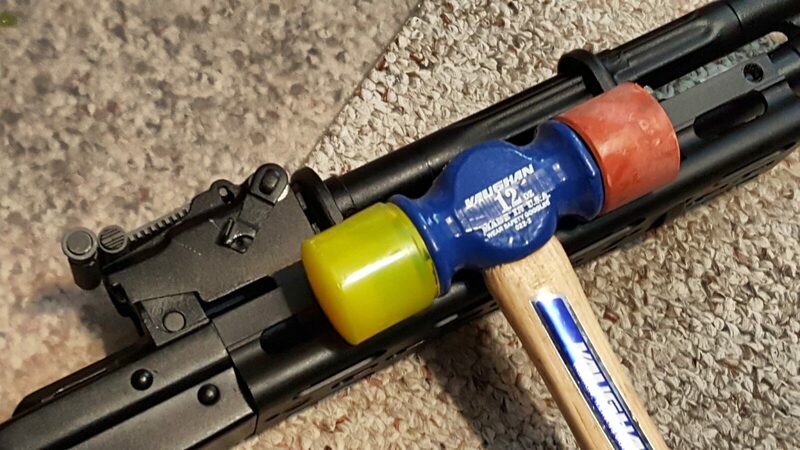 An important design point is that it connects like a handguard and doesn’t clamp anything on the barrel to transfer heat. That was a beef I had with the Midwest Industries rail design I tried years ago. 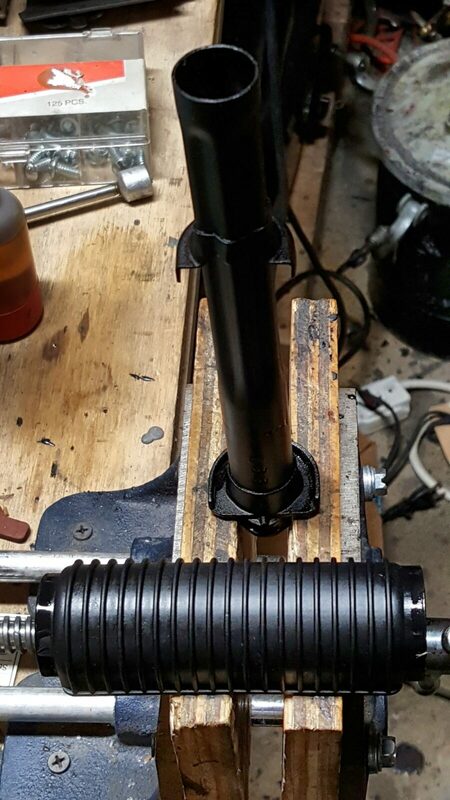 It required the installation of a clamp on the barrel. 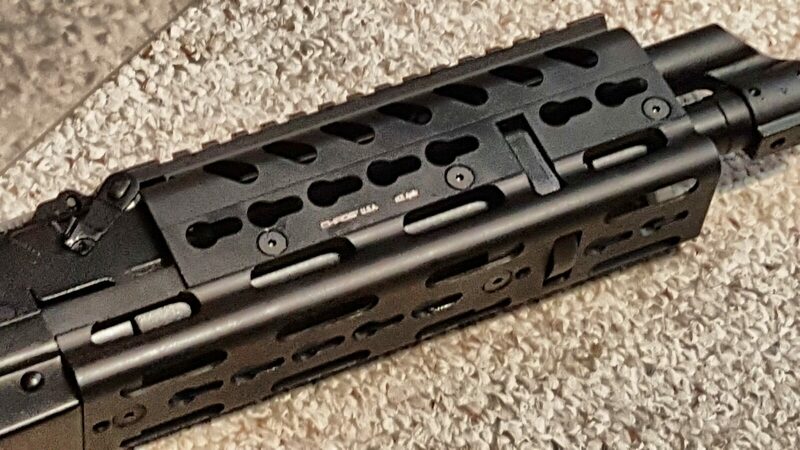 At any rate, I decided on the Chaos Apollo FM11L Keymod handguard. 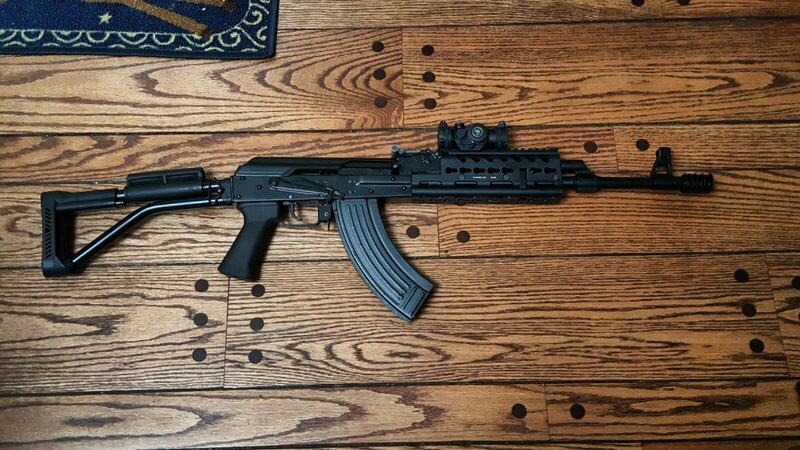 By the way, Chaos does not list on their website that this FM11L will fit the FM-AK47-21 side folder so I called them. The guy I talked to said they would take a return if it didn’t fit and I didn’t beat it up. I was pretty sure it would fit so I went ahead and ordered it. 1] Make sure your rifle is unloaded! I can’t stress this enough. 2] Push in the dust cover retainer at the rear and remove the cover. 3] Remove the operating rod and the bolt carrier group. 4] You will need to rotate the gas tube retaining lever to remove the gas tube. Now this thing is on incredibly tight. I thought Zastava had very tight levers but they have nothing on Molot. 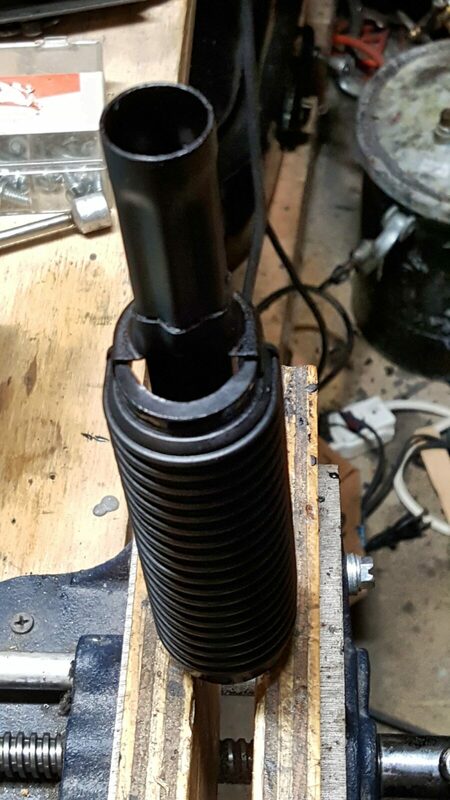 You will either need non-marring pliers or a polymer or wood punch to swing the lever up clockwise until the gas tube assembly can lift out. 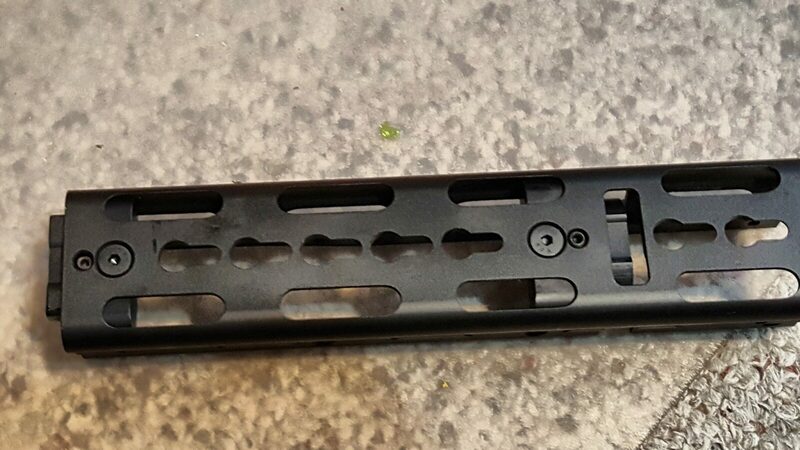 5] On the right side of the lower handguard retainer, you will see a small lever laying parallel with the barrel. It will need to be rotated 180 degrees towards the muzzle and this is another incredibly tight fit. I had to use stout needle nose pliers in order to rotate it. Once rotated, you can slide the handguard retainer forward. You may find you need to tap it a bit with a rubber mallet – I did. 6] Now, you need to remove the gas tube cover and this is one of the questions I get asked most frequently. The cover is a semi-circle and rotates out of the semi-circular shaped retainers. Clamp the forged steel end (not the tubular end or you will crush it) and firmly rotate the cover. You may find it turns easier clockwise or counter-clockwise and either way is fine. Rotate it 180 degrees either way and then you can pull it away from the tube. 7] Next up is to install the Apollo FM11 lower. This is where their engineering prowess really shows. Their rail is two parts so remove the three hex screws from each side and set the upper half to the side for the moment. 8] Now unscrew the bottom screws and slide the internal aluminum part backwards out of the way. This part will actually slide into the handguard retainer and lock the unit into place. This is why there is a slot for the retainer. Look at the fitment of the parts – they thought this out. Be sure to screw in the set screws also to lock things in place. 9] For the next part, you install the lower by putting the rear tab into the front of the receiver just the same as any AK-style handguard. Now the front requires you to get the retainer in the right place to nestle into the lower. Get the angle right and slide the internal aluminum retainer part into the handguard retainer and screw the internal part back together. The angle must be right so if you can’t get that internal insert to slide into place, move the handguard’s front up and down until it does. 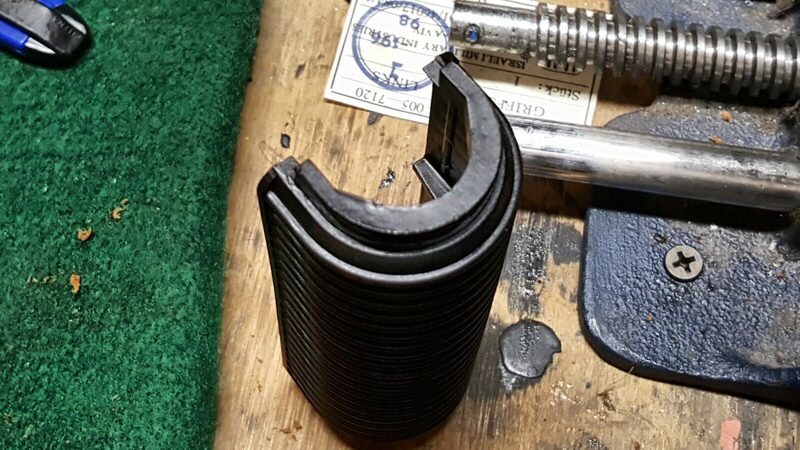 Then swing the handguard retainer lever back into position – it will be a tight fit so tap it into place with a rubber mallet. It would not take a ton of pressure – if it does, check fitment. Over the years I have read guys put a ton of pressure on the levers and snap them – the pressure required is firm and you should see movement as you tap the lever into place. They key is tapping and not trying to do one big “mongo smash” hit to rotate the lever. 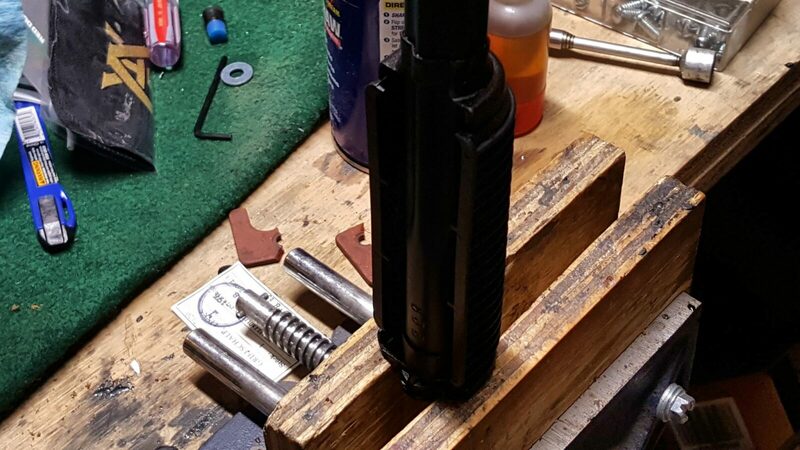 Once done, the lower should be absolutely rock solid – mine sure is. 10] I then installed the gas tube. Nothing attaches to the gas tube so you can remove or install it as needed. I then used my rubber mallet to tap the catch lever back into position. 11] I then installed the gas tube cover by lining up the holes and installing the screws. At this point it is done. I installed a Vortex Sparc II nice and low on the rail. I like the cheekweld when I rotate the cheekpiece into position. It does NOT co-witness with the iron sights but I really didn’t care about that – I can remove the sight real fast if I ever need to. I really, really like the fit and feel of this rail. My side folder can lock folded. I did not need to change anything to support the folder. 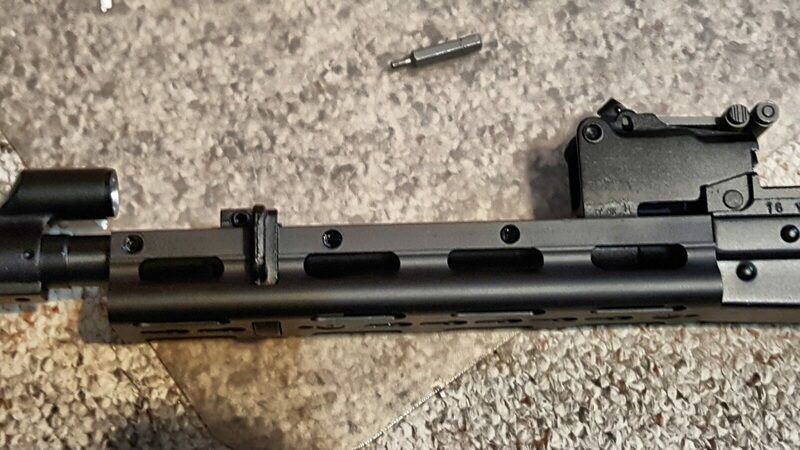 CNC Warrior’s M92 PAP Picatinny Rail Mount is Excellent! A M92 is screaming for an optic of some type. My preference is a red dot and I run a Primary Arms M4 clone on my first rifle and will use a Vortex Sparc on this new rifle. As some of you may know, I have a Stormwerkz rail on my first M92 that I custom built and it has served me well. The only draw back with the design is that you install the button head screws from inside the dustcover. 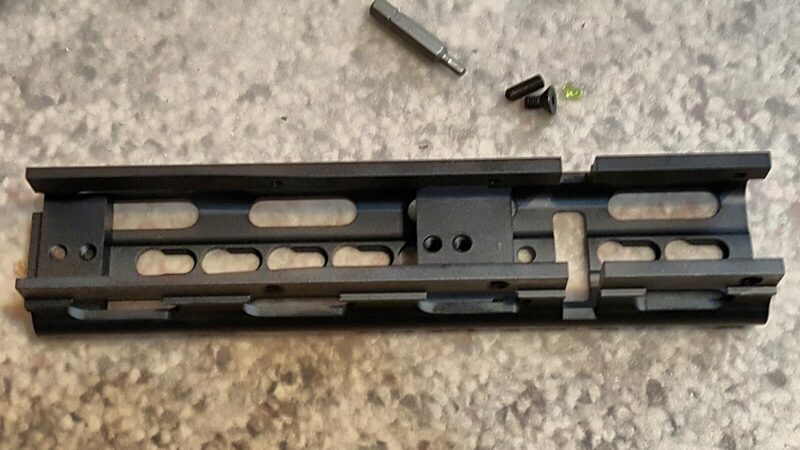 Because of this, you will notice the bolt carrier does hit screws. I have shot a ton of ammo – well over a thousand rounds – from this rifle and the bolt carrier shows no harm but you do see the scuffed screws. When I heard that CNC Warrior had a mount, I had to take a closer look and sure enough, they had a different approach. Their screws go through the rail and screw into the thick steel portion of the dust cover that runs to the hinge. 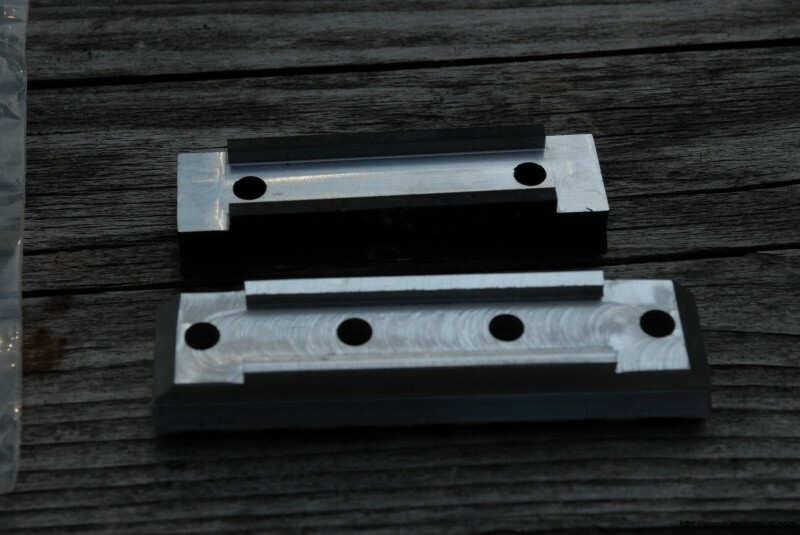 I talked to Denny, the owner of CNC Warrior, about my plans and he recently switched over to a four hole model that will give a person more options when installing the rail to work around the very hard spot welds — basically you just need two screws so with four holes, you pick the two you like that enable you to miss the welds. If you look closely at the next photo, you will notice small circular indents in the steel – those are the spot welds that are harder than the surrounding steel and can be an absolute bear to drill through. 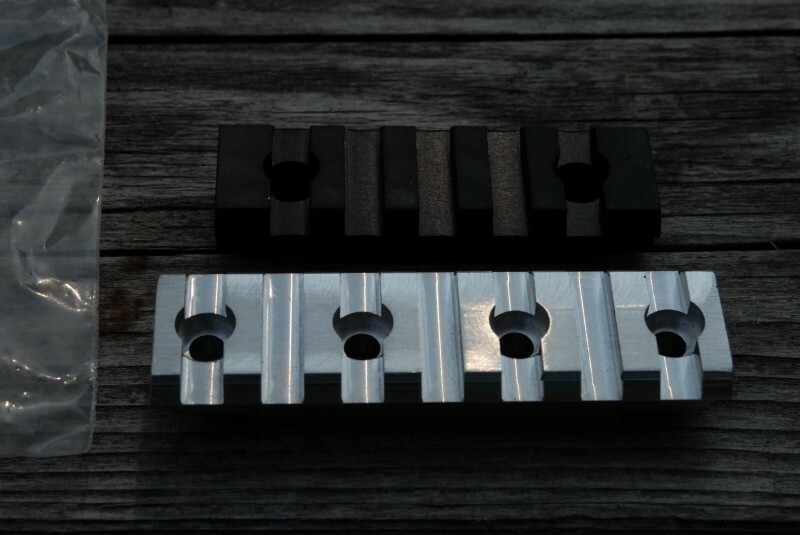 Thus, with CNC Warrior’s new four hole rail, you can slide it back and forth until you get two holes that clear these welds. Please note that Denny sent me one of each – the old two hole rail and the new four hole rail – so I could show you folks the difference and he did not have time to have it finished so it is bare metal in the photos. I used Molyresin to finish it flat black but that is not something you will need to worry about. 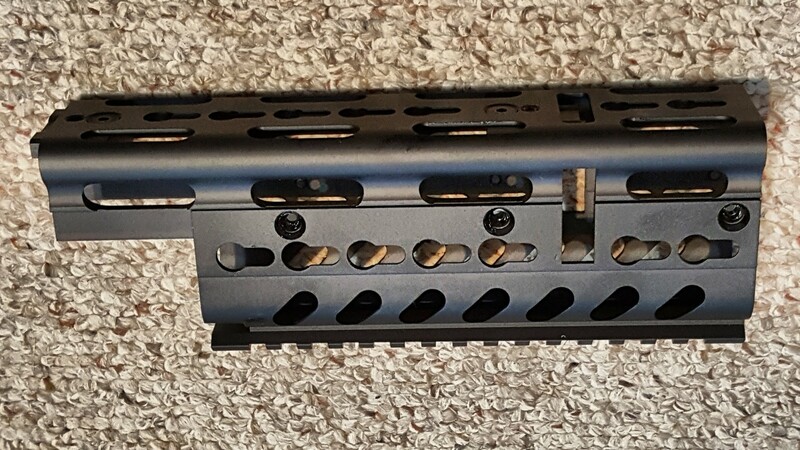 Going forward, when you order his mount you’ll get the four hole rail section already finished black. 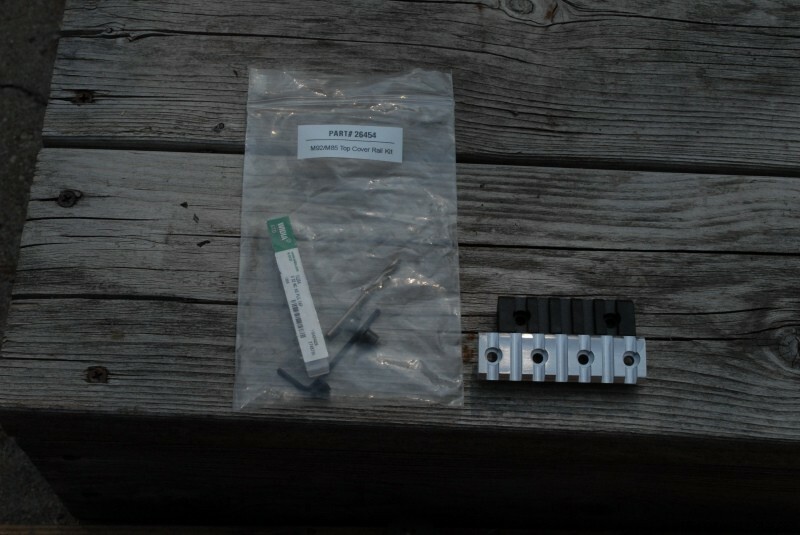 Included with the picatinny rail is their installation kit and instructions that makes installing it a breeze. In a future blog post I’ll show you just how easy installation is and how you can do it with a hand drill and some cutting oil.